Comments or questions about these documents should be directed to Jennifer Harvill or Katie MalinowskiThe Black River Watershed Initiative encompasses both a Black River Watershed Management Plan, which focuses on the enhancement, protection and improvement of water quality in the Black River Watershed, and three additional studies which will provide a more in-depth understanding of the watershed. The three additional studies include a Socioeconomic Characterization of the Watershed, a Stakeholder Outreach report and a Groundwater Assessment. The intent of these “sister projects” is to strengthen our understanding of the Black River Watershed by learning about its inhabitants, understanding socioeconomic trends such as population and job statistics, and more fully characterizing groundwater resources. The overall goal of the initiative is to ensure that the resource, the Black River and its drainage area, and the quality of water within it, are protected and improved wherever possible, and that the resource continues to provide for the needs of those that depend on it for their livelihoods, well being and recreational opportunities.Preparation and implementation of the Black River Watershed Management Plan will advance the protection and restoration of water quality and ensure compatible land use development, helping to protect the River’s scenic and natural resources. The planning process will include building community consensus; watershed characterization; inventory of existing conditions; identification of problems and opportunities; identification of land and water use controls and institutional arrangements for water quality management; and identification of specific resource protection and management needs. 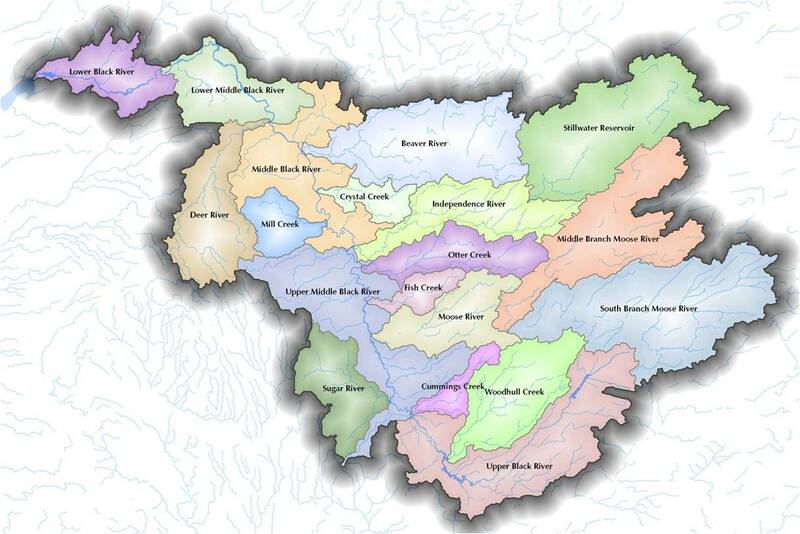 The Black River watershed spans Hamilton, Herkimer, Jefferson, Lewis and Oneida counties. The Black River, a designated Blueway Trail, is a major destination for scenic viewing, fishing and water-based recreation, including kayaking and rafting, which are significant contributors to the local and regional economies in the Tug Hill and Adirondack regions. The river is a major tributary of Lake Ontario and also serves as the drinking water supply for the City of Watertown and Fort Drum. Preparation of the Black River Watershed Management Plan is being coordinated by the Lewis County Soil & Water Conservation District. The plan is being prepared through consultant services (Bergmann Associates, along with Camoin Associates) procured by the Town of Grieg and overseen by a Project Advisory Committee, which includes numerous agencies and stakeholders from each of the Black River counties. It is funded with monies from two Environmental Protection Fund grants to the Town of Greig and matching funds from the Black River Advisory Committee Fund (Brookfield Power) and Senator Griffo. A National Fish & Wildlife Foundation grant, as was secured by the Tug Hill Commission for the three additional studies being completed as part of this initiative. In order to adequately educate the public and interested agencies about the project, learn from their experiences about key issues and concerns facing the region, and identify potential actions to take in the future, four different methods of outreach were held in the beginning of this planning process and reported on in this document. Three identical Visioning Workshops were held in three locations throughout the watershed in May of 2008. Following the Visioning Workshops, six focus groups were identified for an additional level of meetings which concentrated on specific topic areas of particular importance and relevance to the Black River Watershed planning area. Steering Committee meetings with project partners were held at various milestones in the planning process. Finally, public informational meetings were held to present the final results of the groundwater analysis, Socio-Economic Analysis, and to present an update of the Watershed Management Plan.